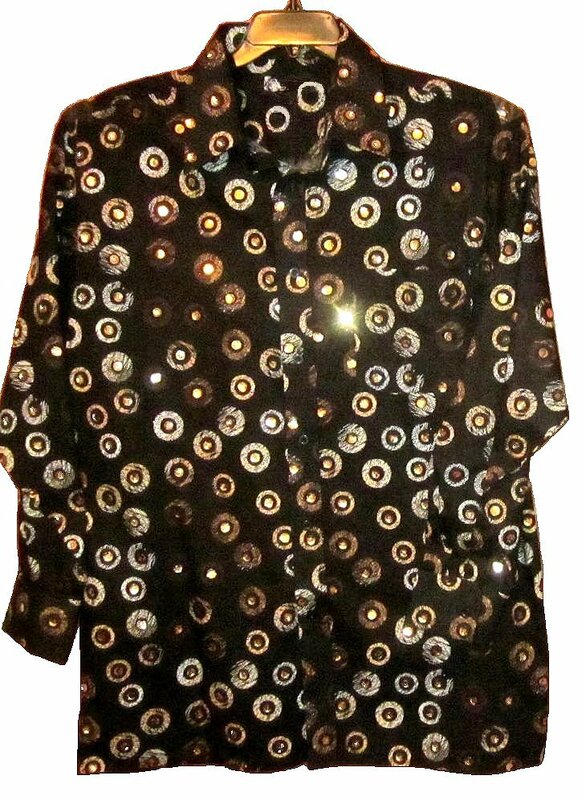 This reproduction disco shirt is more dazzling in person. It's gorgeous. The background is not as dark. The true gold real sequins are very bright and sparkly. The sequins are real, not dots. The light black fabric is very sturdy. Since the sequins are real, the shirt is a bit heavy. It is washable inside out. Hang Dry. Do not dry clean. Sturdy enough for a performer, but may be warm. The shirt measures approximately 52" around at armpit level for a 48" chest fit. In the back between the shoulder seams it is 23". The length is 36", a bit long. The sleeve length is 34.33". This is a never worn prewashed shirt. Steam to remove wrinkles and again, do not dry clean.